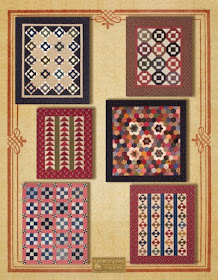 I'm blessed to have several new fabric collections coming in very soon, and when taking stock of inventory and space.....well, I need to make some room. 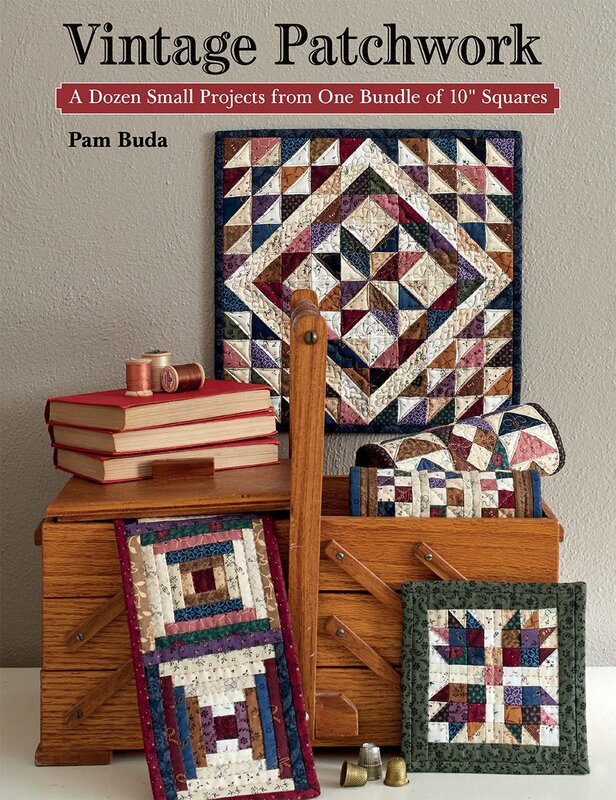 You'll find Fat Quarter and Fat Eighth bundles of complete fabric collections on sale on my website! (Color bank bundles are not on sale.) I've marked them down from 15% to 40%. Quantities are limited so don't delay. Click here to browse the sale. Be sure to fully click on the bundle description to see the regular and sale prices. Letters From Grace is Here!!! Hi! I'm so glad to be back to work, albeit part-time, it still feels great to be productive again. 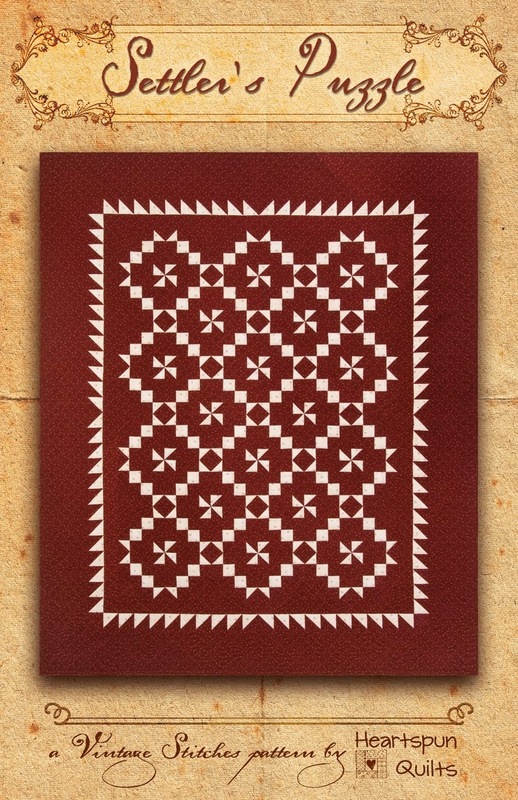 More on this in a bit because I am so jazzed to say that my new pattern, Letters From Grace, is ready to ship! This is such a fun quilt to make. 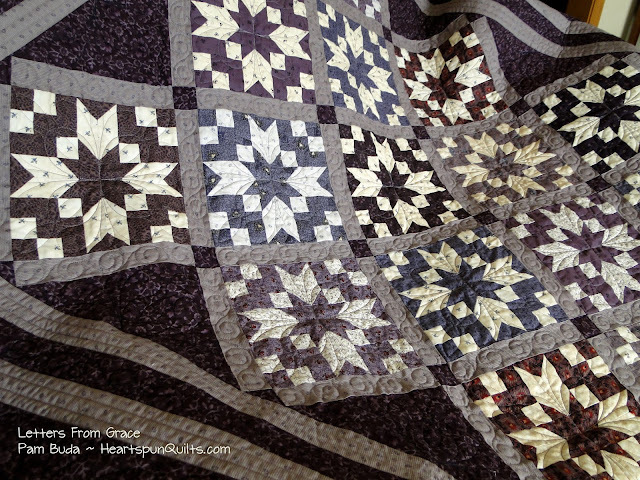 I chose the unusual and oh-so-pretty Black Beauty Star block for this quilt. Love, love, love!!! 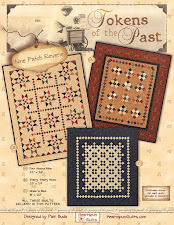 I also love how the corners of the block, paired with the sashing and cornerposts create a secondary pattern. Don't you love when that happens?! The blocks are 8 inches....a nice size. 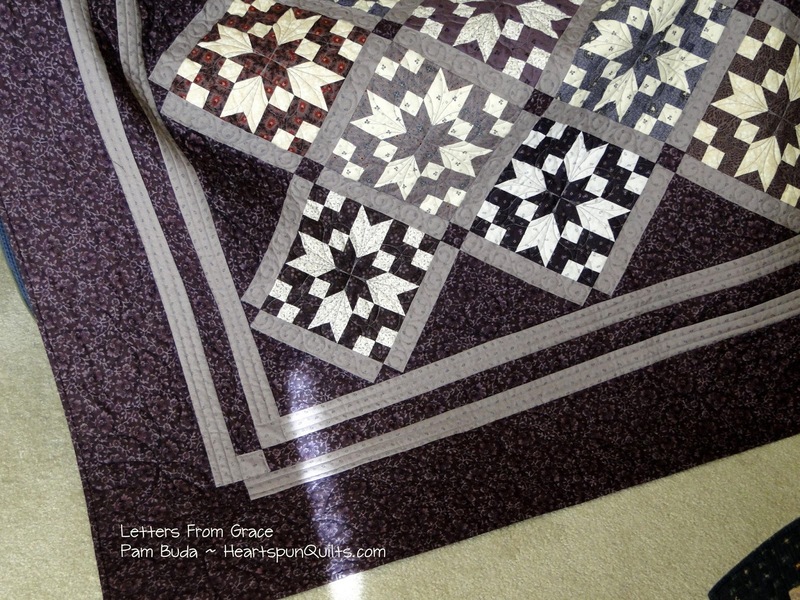 It's so fun to pair up the light and the plum prints for each block. I promise that this is an easy to piece project. You know my directions and graphics will lead you every step of the way. 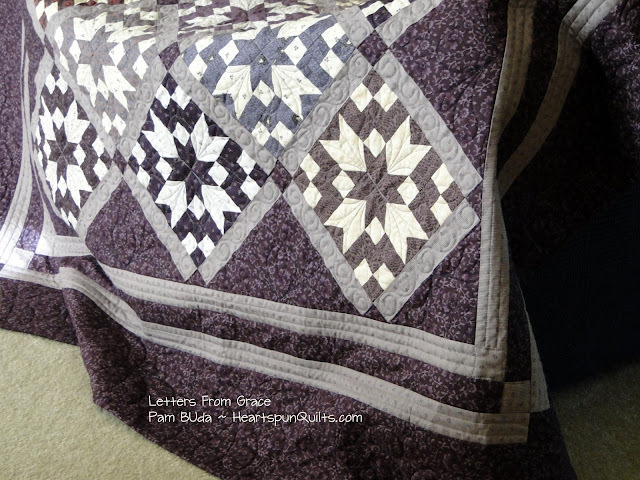 If you're a regular reader of my blog, you know how I love pieced borders, right?! 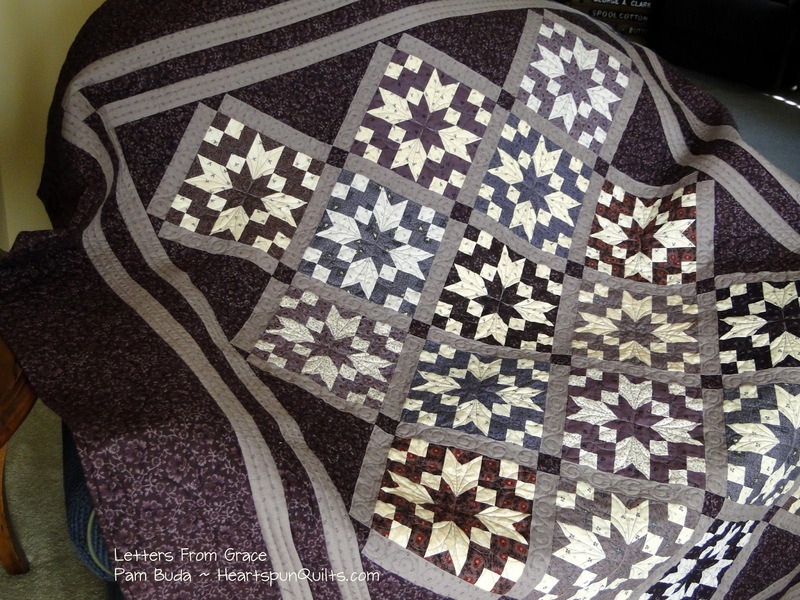 Well, not every quilt needs a pieced border, but that doesn't mean the border shouldn't be interesting. 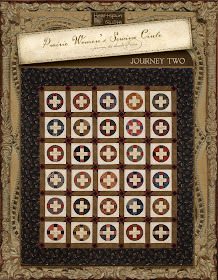 I chose to play a bit with the light print I used in the sashing, and created a double border frame design just by playing with the cornerposts. It's simple and adds a lot to the quilt without a lot of work. I hope you like it! I made my quilt using all of the prints in my new fabric collection, Old Plum Calicos for Marcus Fabrics. 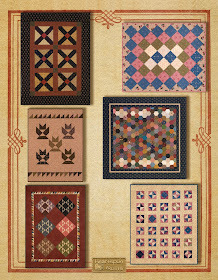 Click here to see all of the fabrics in the collection. 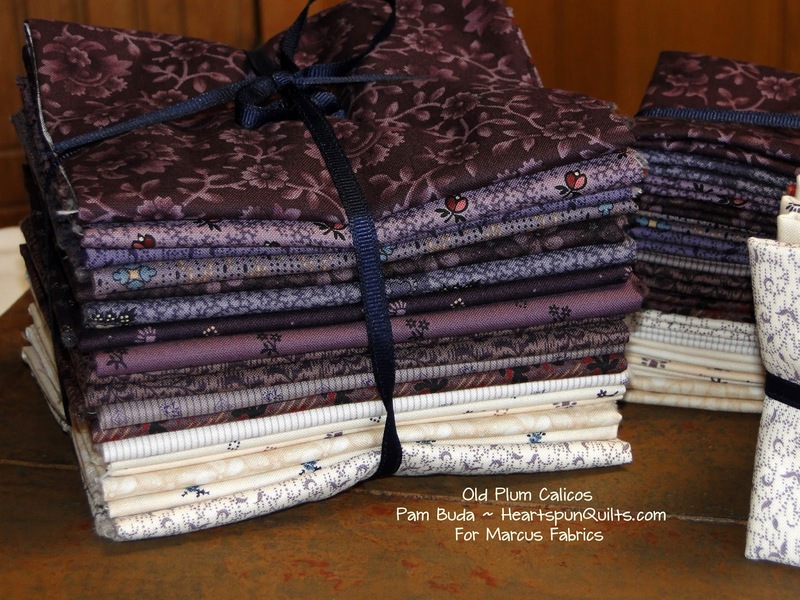 Old Plum Calicos is being delivered to your local quilt shop right now!! 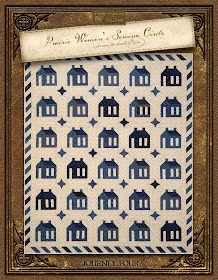 My Letters From Grace pattern is ready to ship today. 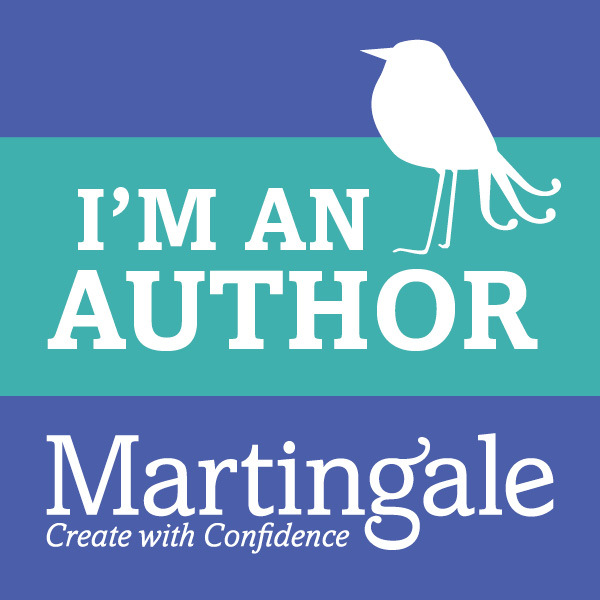 Click here to order one for yourself. 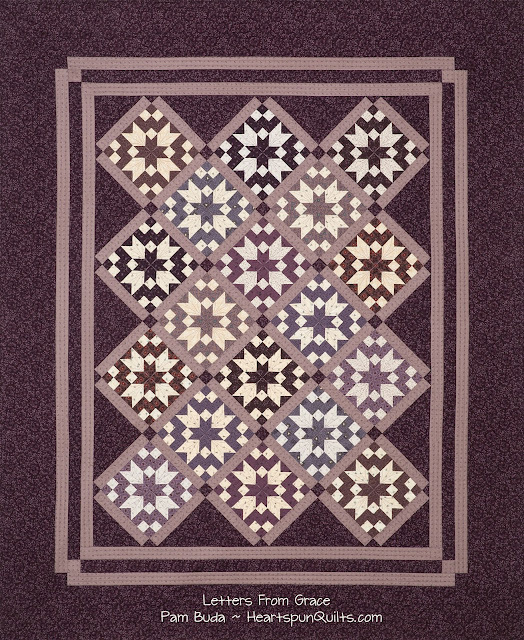 If purples and plums aren't your favorite colors, this quilt will be just beautiful in whatever color you'd like to make it. 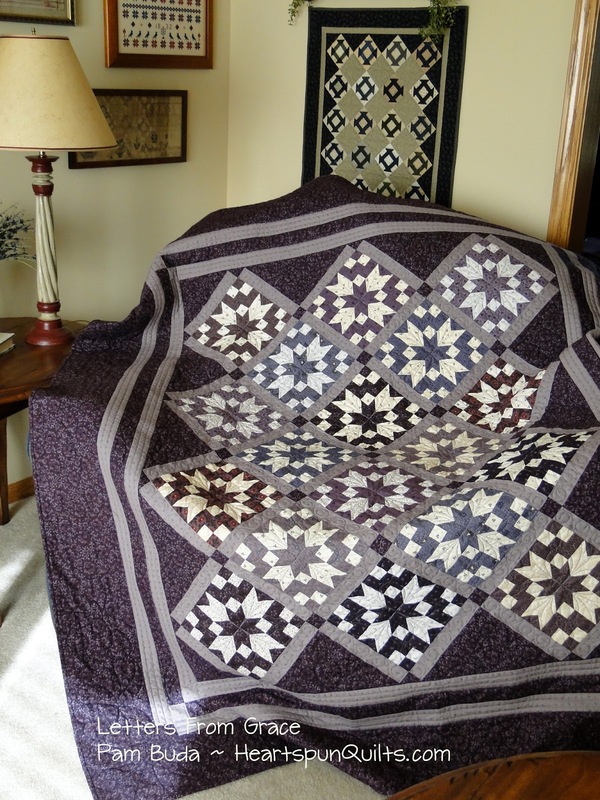 The quilt size is 62" x 75" and is Fat Quarter friendly. As for me, well, surgery went very well. I had a minimally invasive hip replacement just 2 weeks ago and am doing very well. I'm finished with home visits and am now going to out-patient physical therapy. I've had a knee replaced many years ago and know how super important physical therapy is to the success of the surgery. I have a terrific PT who is also accredited with an osteo certification. He sure knows his stuff! I'm a person who chooses to keep myself pretty busy, so two weeks of sitting much of the day in a chair was almost more than I could stand. I did do quite a bit of hand sewing, which was nice, and read a few books, but I much prefer being back at work. I'm here on a somewhat part-time basis depending on how much energy I have and PT appointments and the like, but it sure feels great! Thank you all so much for your very kind Get Well wishes sent by email and Facebook and cards in the mail. 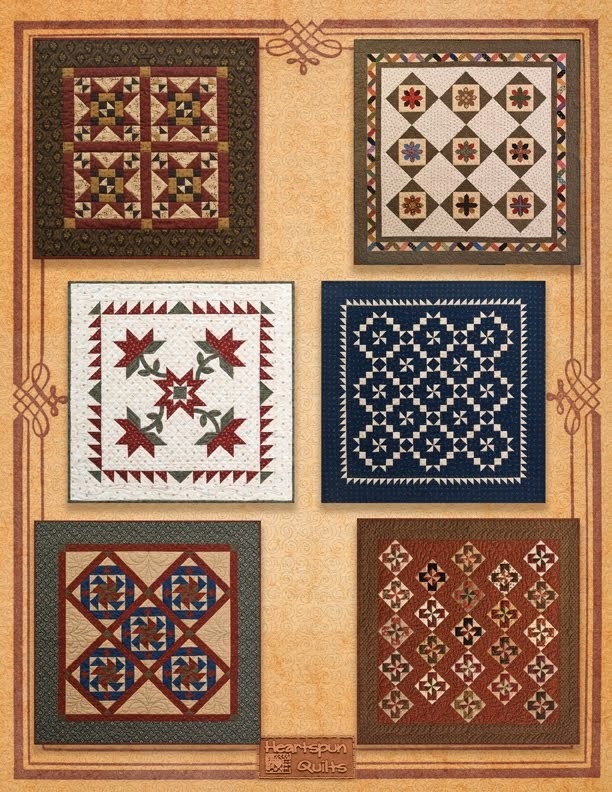 All touched me very much and just remind me of how caring and generous the quilting community is. 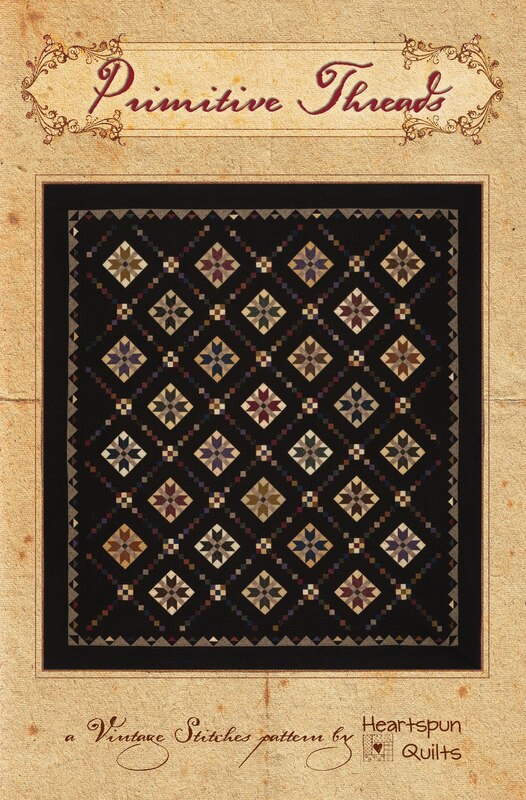 I appreciate all of you, my dear quilting friends, more than you'll ever know! 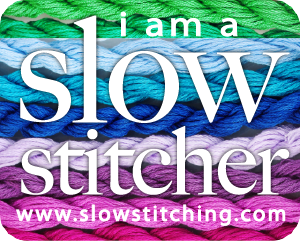 Just a quick note to say that I'll be away from my sewing machine, desk and computer for a couple of weeks. I'm going in for a tune-up of sorts. This week I'll be having my first hip replacement and will be recovering awhile at home. This is my second joint replacement (left knee was done 9 years ago), and in 7 more weeks, I'll be having another. Cursed with the big "A" Rheumatoid and Osteo arthritis. My co-worker Deb will keep orders going while I'm on R&R, and my wonderful family will take good care of me. The people close to me know this has been a long time coming and we will all be glad when it's over. 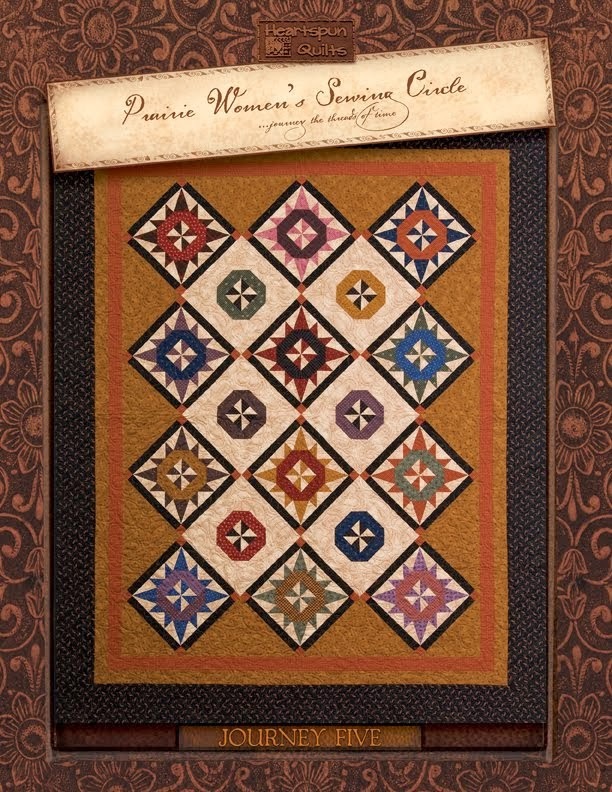 I have to give a big shout out to all the wonderful women I am blessed to work with at Marcus Fabrics. They have been more than understanding and supportive of me in preparing for these surgeries, and together, we have worked triple overtime getting three more fabric lines into production ahead of my surgery. 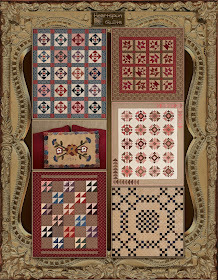 You'll have lots of new fabrics and quilts to inspire you coming soon. You know I often speak about how my mind lives a lot of the day in the 19th century, and today I'm so, so glad we're living in the 21st century because if not, my future would be very different in that I'd likely be confined to a wheelchair. Much to be grateful for and I'm so blessed. Keep a good thought for me and I'll be back soon. Just didn't want you to wonder where I'd gone to! 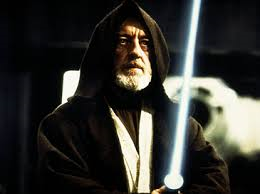 There's been a disturbance in The Force. Old Plum Calicos Arriving Soon! I'm so excited! October means the arrival of Old Plum Calicos! 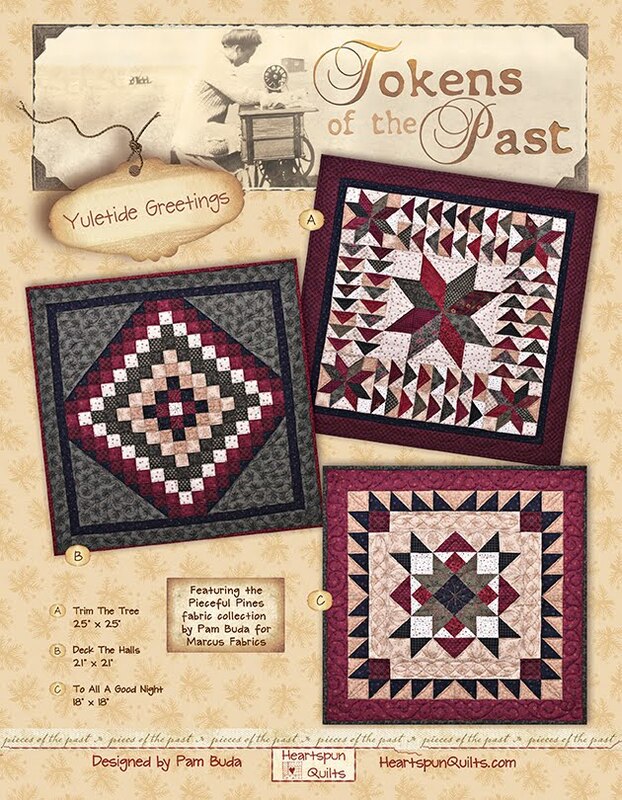 They just arrived on my doorstep and that means they are arriving at your local quilt shop, too! 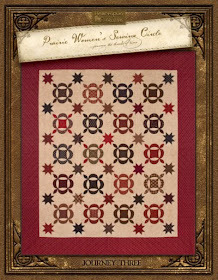 We've begun to cut our Fat Quarter and Fat Eighth bundles and they will soon be in the mail. 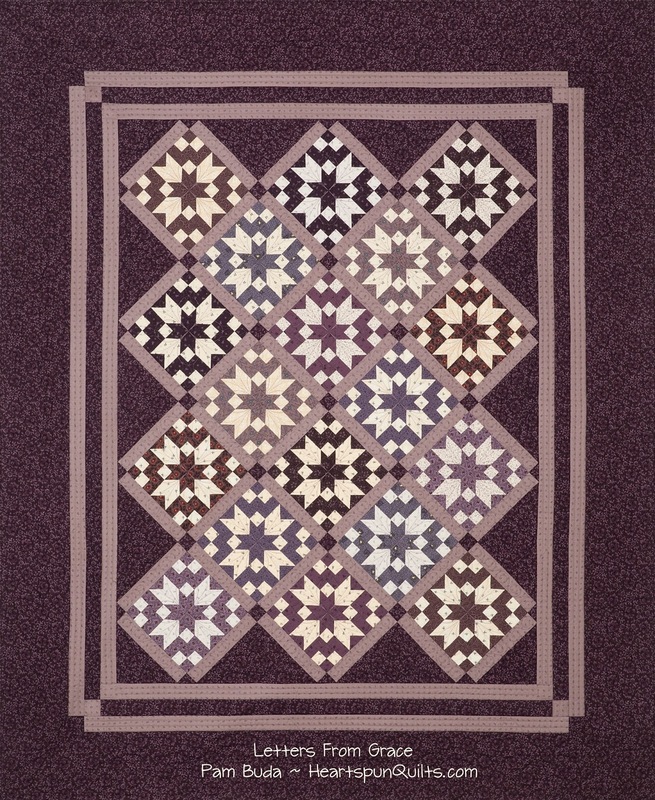 These pretty purple, plum and violet prints are only here for a short time, so be sure to get yours before they're all gone!! 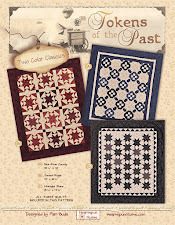 Ask for Old Plum Calicos at your local quilt shop! 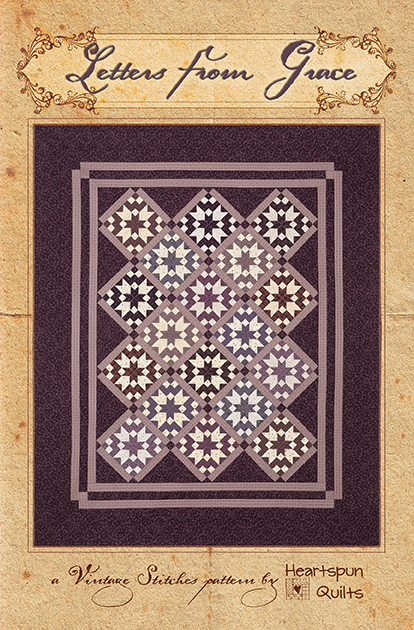 Here's a sneak peek at the quilt I designed using all of the prints in Old Plum Calicos. 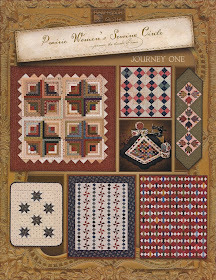 The pattern is called Letters From Grace and will be available later this month.